The two images above show parts of San Juan Capistrano in the 1960s. The top image is from 1960, and the second image shows El Adobe Plaza on Camino Capistrano in June 1966. The plaza is named for the adjacent El Adobe Restaurant, which is owned by Richard O’Neill, Steve Nordeck, Tony Moiso, and Gilbert Aguire. The restaurant's northern section is the Miguel Yorba Adobe (1797), and the southern section is the old jail, established in 1812. There have been two examples of large-scale adaptive re-use featured in the Register lately. First, Boeing's historic Building 22, off Bolsa Ave in Huntington Beach, has been converted into a test facility for missle guidance and navigation systems. These are the same buildings where Douglas Aircraft built the upper stages of the rockets that sent the Apollo astronauts to the moon. Also the IRG development company is planning the conversion of MCAS Tustin's north hangar into an indoor-outdoor park. Civil engineer Floyd George McLellan, Jr. (1925-2008) passed away recently. From building inspector to agency director, he served the County's Department of Building & Safety for 37 years. He was instrumental in the development of South Orange County and was known throughout the state for instituting new policies and practices that have since become widespread. The Laguna Woods Historical Society is looking for war veterans "and those who held up the home front" to tell their stories for a federal Veterans History Project. I'm surprised that Laguna Woods has a historical society. The only historically significant landmark there, in my view, is the Leisure World globe - and it was destroyed in 2007. I'm told that the Laguna Woods Historical Society is fairly large and active. Yes, I suppose there aren't many topics for them to discuss beyond the area's ranching history and the development of Leisure World. But I hear they're making efforts to record the history of that development NOW (while it's still relatively easy to do) and save all the documentation for the benefit of future generations. That's a worthy and refreshingly forward-thinking goal for a historical society. I have always had, over the course of my life, a soft spot for the Laguna Hills area - even though I never actually lived there. My mother, a long time ago, had a close friend who, along with her husband, had a house in the neighborhood just north of Paseo De Valencia. It happens to be my favorite house from my past. I've always said that when the real estate bubble crashes and I ever got any money I would buy that property whenever it became available. It is really the only property I would ever come back to Orange County for. I have fond memories of passing by the Leisure World globe a number of times in the early 1980s. It was truly a wonderful era. If only the people in Laguna Woods and Nellie Gail Ranch knew how beautiful the area once looked, and how much they're being ripped off by their HOAs and overpriced homes. I urge all of them to get out now before the economic collapse strikes, and don't look back. If anyone from Laguna Woods or Nellie Gail Ranch is reading this, my message to you right now is this, if you think you have a pot of gold in the middle of "God's Country" you are badly mistaken. The long overdue end to the real estate bubble and the coming economic depression will mean the end to most of the newer "master planned communities" of south Orange County, and hopefully the beginning of a redevelopment trend that will help these areas better reflect their history and the natural beauty they once had. RE: The Capistrano picture. That was taken on top of the north facing ridge of the old Forster Canyon County Dump. 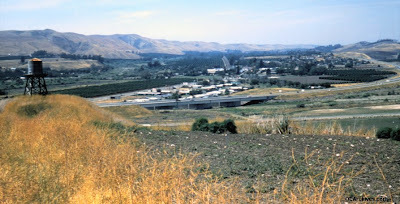 The small housing area seen on the other side of the freeway overcrossing of San Juan Creek is the Stoffel Tract, which was a post-war development and the first in San Juan. That's a very familiar view to me, as I was all over those hills as a kid, hiking and horseback riding when this picture was taken. Capo Beach/San Juan was a great place to grow up in the 50s and the 60s.